So, crazy idea. I’m seriously considering hosting a group break in January. I wanted to mention it because I need input and suggestions. First, what do YOU want to break? Obviously, availability and price come into play at some point, but in a perfect world what would you want to open? Do we go retro? Do we stay current? No, I’m not busting 5-Star, so don’t even go there. Second, how much are you willing to pay for said break? Are we busting 2012 Bowman and GQ at $20 a slot? Are we busting 2007 Flagship at $5 a slot? Give me an idea of what a sweetspot would be. Third, are you INTERESTED in a break? Is there anything even worth breaking right now? I’m just looking to gauge general interest. How many people who read this would want “in”? If I get 2 suggestions and no interest, that’s ok, we’ll try again later. If I get 10 people clamoring to bust something, game on! Discuss amongst yourselves. I’ll be back in January with either a Break announcement, or a post about what I opened for my birthday, lol. Have a great Christmas everybody! Well, it’s December. I have a real love-hate relationship with December. I love cold weather, I’m still a New Englander at heart and there’s just something about the chill, seeing your breath outside, the wind, the quiet, the gray skies. It’s peaceful. Winter also means skiing, which was a huge part of my life for a long time, even though I don’t get to go very often, it’s still something I think of fondly. December also brings my birthday, and Christmas, and depression. I don’t think I have what we’re now calling “Seasonal Affective Disorder”, at least I’ve never been diagnosed with it officially. I just don’t really get into the season, and I don’t really like my birthday in general. I’ve never really had a “good” birthday. When I was younger it was tough to have birthday parties because my birthday is so close to Christmas (just a couple days). My parents also usually took my younger brother to hockey camps in Decemeber. So, I was alone for a good number of birthdays. I’m not blaming them, we always celebrated when they got back, but on the actual day of, I was usually by myself. There were a couple times I managed to cobble together some sort of event. I can remember once or twice having Chip, Chris and Josh over for some videos games, those were good times, but I think that was about it. The biggie was my 18th birthday. I had to work that night and when I got home everyone was gone, there was a note on the counter and a $20 bill. The note read “Happy Birthday, get yourself some pizza, we’ll be back on Saturday”, or something similar. That was pretty much the final straw. From that point on, I just didn’t really enjoy my birthday. My wife has been really good about making sure we always do something for my birthday now, even if it’s just going out to eat. She’s knows I’m kinda down this time of year and always tries to cheer me up. This year we tried getting people together for a “End of the World” party, since my birthday and the end of the world seem to be lined up nice and fittingly. No dice. Everyone is out of town or traveling. I had really wanted to go big this year. Big party, food, booze, the whole 9 yards. Oh well. Christmas is a whole other “thing” that I won’t get into, but let’s just say that I’m not really looking forward to it. This almost perfectly sums it up. Sigh. At least there’s eggnog. At least I have my family, my friends, my health. There’s a lot to be thankful for. I usually remember that in the end, but don’t mind me if I get a little “bah humbug” between now and then. About two months ago, I had a mysterious email from PC Gamer magazine. 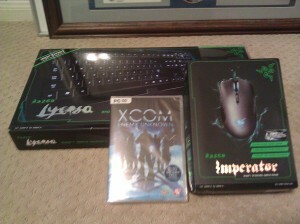 I had won a contest for a new set of gaming hardware and a copy of XCOM:Enemy Unknown. They asked for my address and I never heard anything else from them. Then, a couple weeks ago, random packages started arriving at my doorstep, one each day for several days. 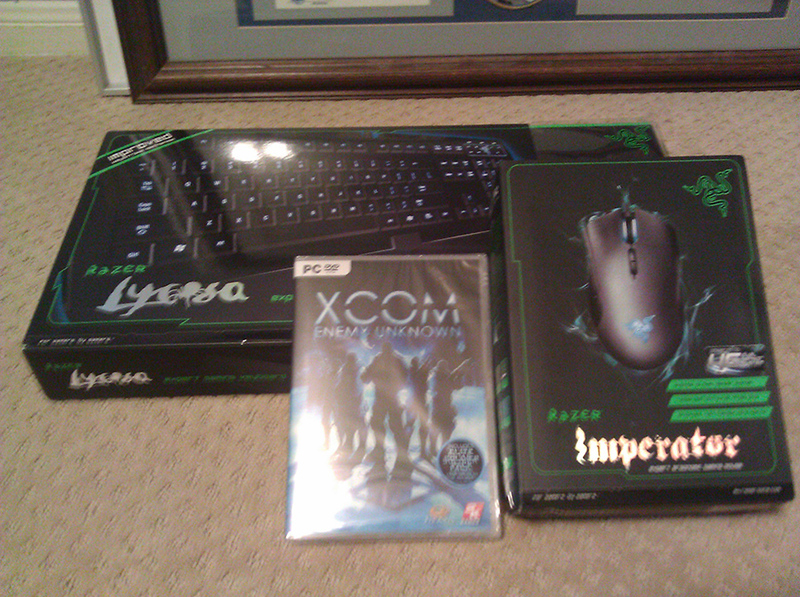 Wrapped in brown paper, with no return labels, and inside were a new Razer Lycos Keyboard, a Razer Imperator mouse, and the game. Of course, the first thing I did was hook everything up and run it through it’s paces. What I came away with was an increasing gratitude that I had won these items, and not actually purchased them. I hate to look a gift horse in the mouth, but compared to my existing hardware, Razer unfortunately doesn’t stack up. I, like most of you, made a rather large purchase at COMC on Black Friday. The exception being that mine just arrived, and you guys were blogging about yours last week. Oh well. At least it showed up, right? I can’t really claim I got anything mind blowing, but I did manage to destroy a huge chunk of my set want-lists, effectively finishing off most of 2011-12, save for a few short prints. That was huge for me. Those finished pages in the binders give me that little happy internal nerd smile. You know the one I’m talking about.